First off – my father-in-law gave me this cool julienne peeler for Christmas. I just used it for the first time today…and I have to say, I’m ready to julienine everything in sight! Potatoes, butternut squash, apples…the possibilities are endless. I love how it slices perfect zucchini noodles! While lentils cook, put all ingredients for sauce in food processor, blend on high for 25-30 seconds or until thick sauce forms. Add sauce to small pan and cook over medium heat to bring to a boil, reduce heat and simmer 5 to 10 minutes. Once lentils are cooked, add to marinara sauce. Take off heat and set aside. In a large skillet over medium-low heat, add zucchini and cook until soft and pasta-like (about 5 minutes). Evenly divide zucchini and top with marinara sauce. A different spin on serving black beans. This can be served as a side or as a meal. These beans have a slight spicy kick and are very filling. You can serve this over rice for an elegant dinner or crush some tortilla chips on top for a less formal meal. Sort and wash beans, place in large bowl. Cover with water to 2 inches above beans. Let stand for 8 hours. Drain beans and transfer to slow cooker. Add 2 cups water and the next 10 ingredients (through oregano). Cover and cook on HIGH for 5 hours or until beans are tender. Stir in vinegar and tomatoes. Serve over brown rice, if desired. Add onion and garlic and saute for 2-3 minutes. Add cabbage and 1 cup of water. Cover with lid and let soften for 10 minutes. When cabbage has softened, add all spices, except the tomato paste. Let set 10 minutes before serving. Spaghetti squash is one of those foods that amaze me. A vegetable that is so normal looking before baking, but add a little heat, and it miraculously turns into a spaghetti-like dish. Amazing. On that note, who discovered this? I mean, did someone one day say, “let’s bake this and see what happens”. However it happened, I, for one, am ecstatic. Bring on lunch! Cut squash lengthwise, in half. Remove and discard seeds. Brush olive oil on cut sides of squash and place cut – side down in a baking dish. When baked, separate the stands of squash with a fork and place in large bowl. Discard shells. In a medium sauce pan, heat butter over medium heat. Add onions, and cook for about 2 minutes. Stir in flour, and reduce heat to low and cook, stirring continually for 3 to 4 minutes. Add milk and vegetable broth and continue, raising heat to medium-high until it comes to a boil and becomes smooth and thick, about 2 minutes. Stir continuously season with salt and pepper. Once thick, remove from heat and add cheddar cheese, and mix well until cheese is melted. Add cheese sauce to cooked spaghetti squash. Mix well. Add baby spinach, carefully mix. 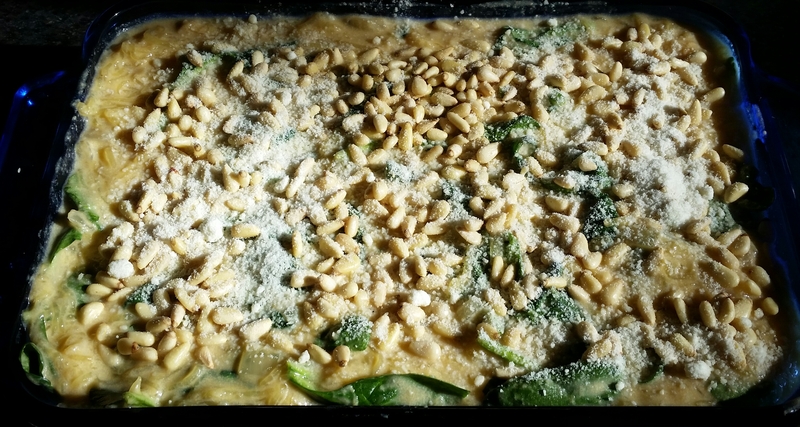 Sprinkle with parmesan cheese and pine nuts. Bake until bubbly and golden, about 25 to 30 minutes. Have I mentioned how much I love vegetables? I mean, I really love vegetables. Not only are they good for you, they taste good. I love the texture of broccoli and cauliflower. The crunchiness of carrots, the tanginess of the tomatoes. My mouth is watering just thinking about lunch tomorrow. This recipe is from the garden grazer; which is the site that gave me the ultimate greek salad, which, hands down, is my favorite salad EVER. 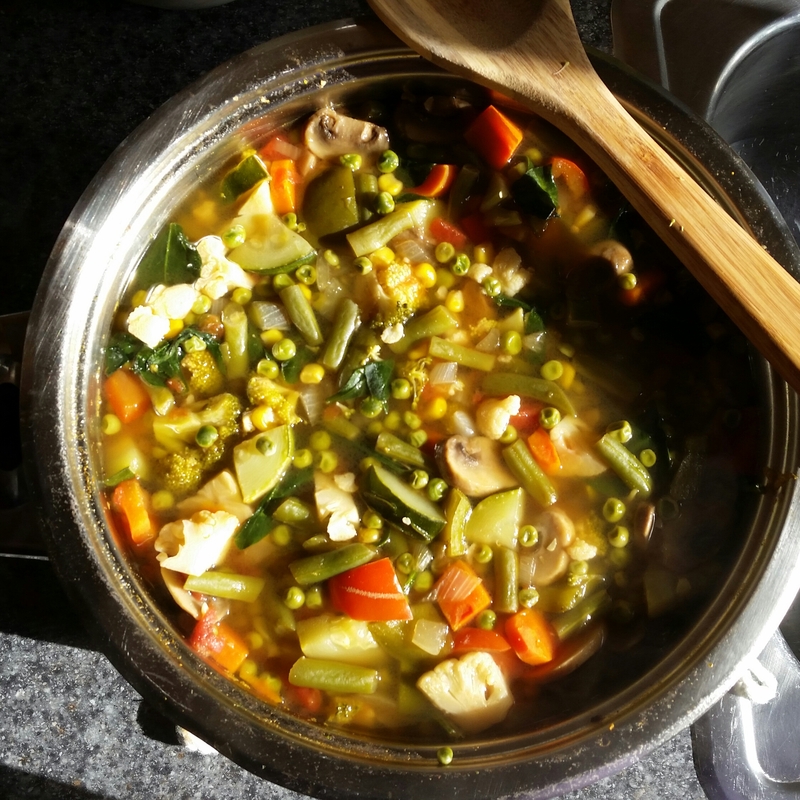 I’ve adapted this vegetable soup slightly, basically packed in more vegetables! In large stockpot over medium heat, saute onion for 5-7 minutes. Add garlic and cook for 30 seconds. 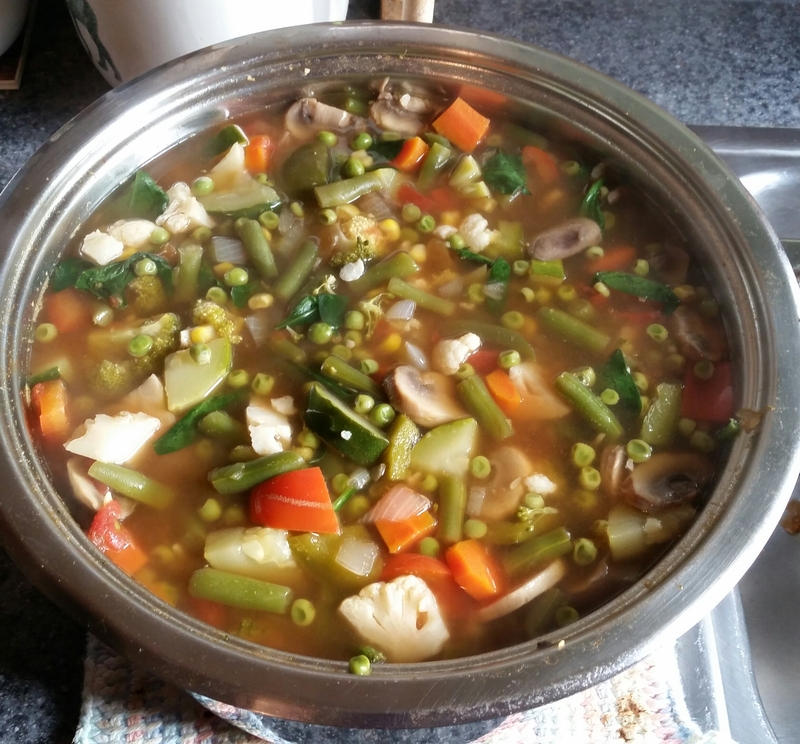 Add broth, tomatoes with juice, and all the vegetables (except spinach). 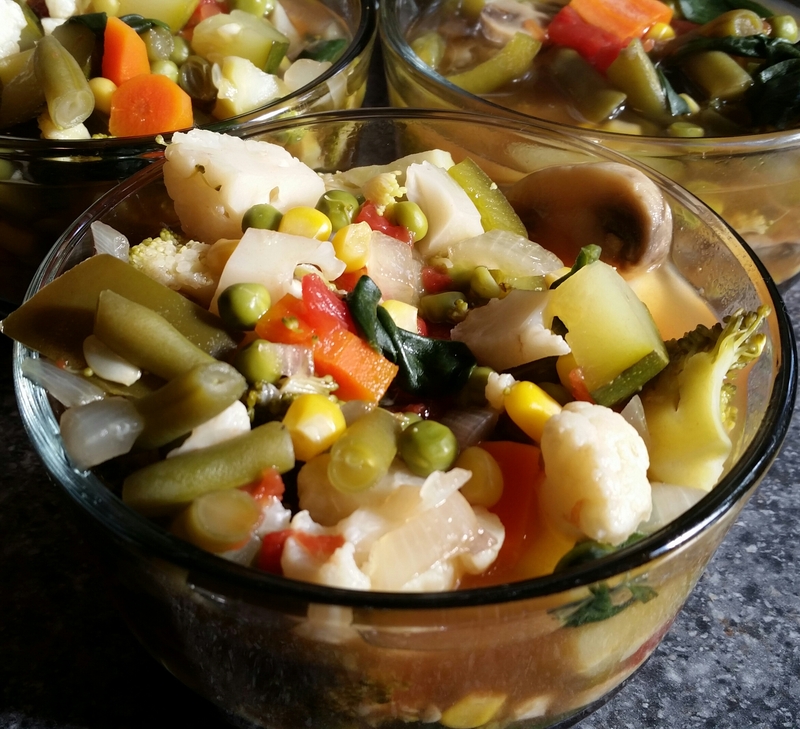 Reduce heat, cover and simmer for 20-30 minutes or until veggies are at desired tenderness. Stir in spinach and salt to taste.